When Saint Tryphon was yet three days journey from Rome, the loathsome demon began to torment the girl, bewailing what awaited him, saying: "Woe is me! Tryphon will no longer permit me to dwell in this habitation; for he comes to cast me forth from here. Three days yet remain till Tryphon arrives. He has the authority to trample us underfoot." Upon uttering these words, he convulsed the maiden and departed from her, for he deemed it too unbearable to meet the holy Tryphon face to face. When Tryphon finally arrived at the palace of Rome, Gordian said to him: "I beseech you to make manifest this demon before our eyes, so that you might question that creature as to why he entered into my daughter, and there are other things I would like to know." Tryphon agreed to help. He therefore kept a fast for six days and remained in ceaseless prayer. 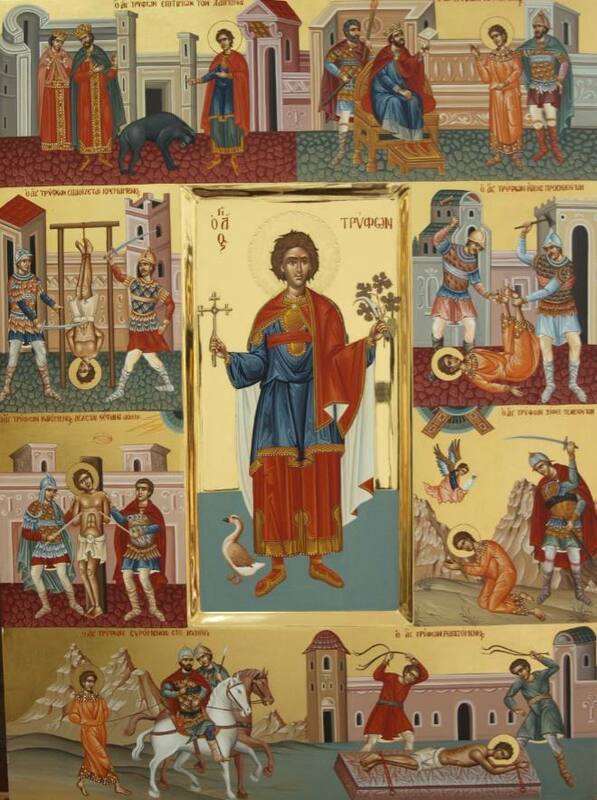 On the seventh day Tryphon beheld a marvelous vision, in which Christ empowered Tryphon with abundant authority and power over the demons, more so than before. At dawn the inhabitants of Rome assembled in the theater, among whom were the emperor and his entourage. In the presence of all, Saint Tryphon then summoned the demon that he discerned with the eyes of his soul, saying: "In the name of Jesus Christ, I command you to appear here before all, that each one here may before your ugliness and your weakness." The demon then appeared before all as a hideous black dog, the head of which was bowed to the ground, not daring to look the Saint in the eyes. "We do not have any power or authority to tyrannize the Christians; that is, those who believe in the almighty God and His Son, the Christ, Whom Peter and Paul, here in this splendid city, preached. Much rather, when we see Christians, we take ourselves far from them.We prefer to draw ear to those who love our deeds and works. 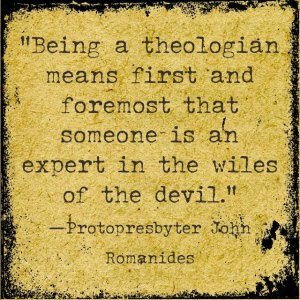 Over such persons, we do have authority to torment them, that is, the idolaters, blasphemers, adulterers, murderers, and users of drugs, potions, poisons and spells. Indeed, we would lord it over those who are envious, jealous, proud, arrogant and scornful, and others like these. Such persons separate and alienate themselves from God with transgressions and lawless conduct of this kind. They come to us with the same disposition and inclination as we. Only such persons do we tempt, since they are doing what we like, that is, disdaining the divine commandments." All those present heard these words and marveled, and filled the crowd with fear. Many among them came to believe in Christ, and those already believers became more steadfast. The demon had been forced to testify to the truth regarding demonic activities. The Saint then rebuked the demon, and that vile creature vanished. Astonished by this, the emperor honored Tryphon by showering him with gifts, and Tryphon returned to his homeland.